With the rapid development of New Taipei City, the city’s districts have been gradually building their own downtown areas that are no less convenient than those in Taipei City, and the Sanchong and Xinzhuang districts are some of the best examples. The areas are only 20 minutes away from downtown Taipei, thanks to the MRT Zhonghe-Xinlu line, numerous buses and the soon-to-be-complete Airport MRT line. 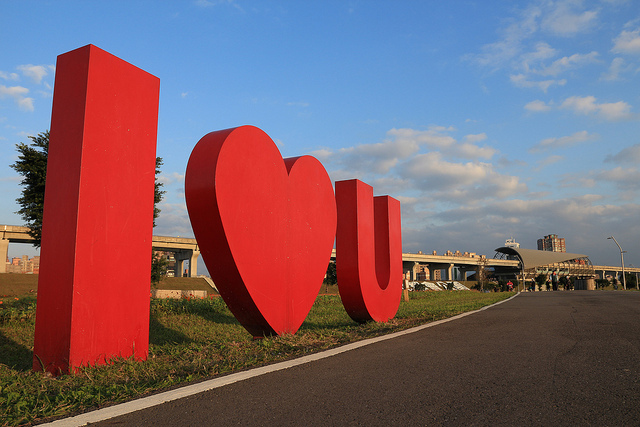 Built right beside Erchong Floodway, the park is now the Da’an Forest Park of New Taipei City – or even better. Just a small walk from MRT Sanchong Station, you’ll be able to capture a stunning panorama of vibrant green, water and dynamic clouds, making it a popular destination for activities from wedding photography to dog (or kid?) walking to exercising. Stretching out 424 hectares across Sanchong, Luzhou and Wugu, the park includes an impressive 24-kilometer biking route, 68 sports courts and several romantic art installations such as LOVE and the Lover’s Bell. 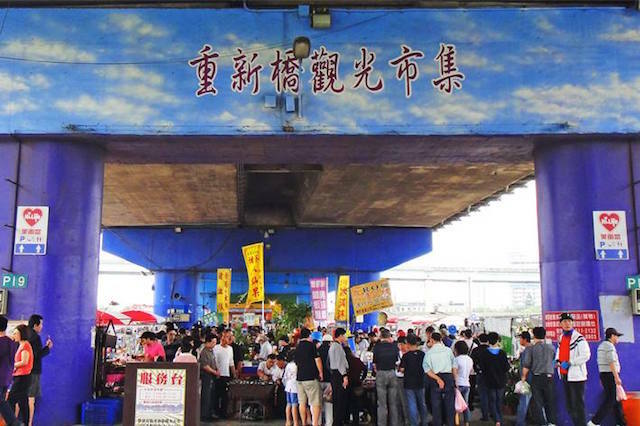 Rebranded in 2006 by the city government, the flea market beneath Chongxin Bridge has now become a tourist market with plenty of fun and good service. Visit the market on almost any morning of your choice – or on Chinese New Year if you’re feeling chatty – and enjoy hunting for —, from antique projectors from Germany to rare camera equipment. There’s also a popular food market inside, ensuring the adventurers get enough energy before they find their trophy of the day. Be sure to check the market’s monthly cleaning days on their Facebook page. Xinyue, meaning new moon in Chinese, best describes the thin arch of white steel of this elegantly designed bridge. Connecting Xinzhuang and Banqiao, the bridge is 725 meters long, crossing over the Dahan River. 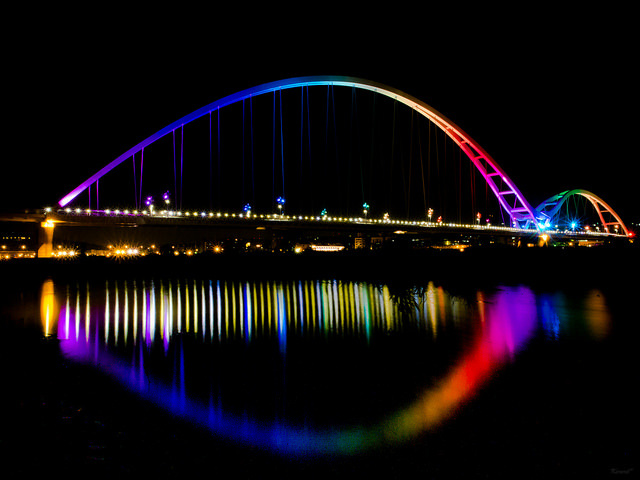 Bring your best camera gear, ‘cause Xinyue Bridge is going to stun you with a most beautiful sight. Lock a spot before sunset to snap the pinkish glows enclosing the pure white bridge, or wait until nightfall to see the rainbow colored lights reflecting on the River, when the bridge is at its most beautiful. What’s even better – the bridge is designated only for walking and biking. In Xinzhuang and Sanchong, the locals are fortunate to have not only one, but two night markets around. Among numerous stalls at Sanhe Night Market in Sanchong, you’ll want to give the traditional stuff a shot – stinky tofu, squid potage soup, Taiwanese meatball (Bawan), fried chicken – ending with a huge cup of papaya milk. 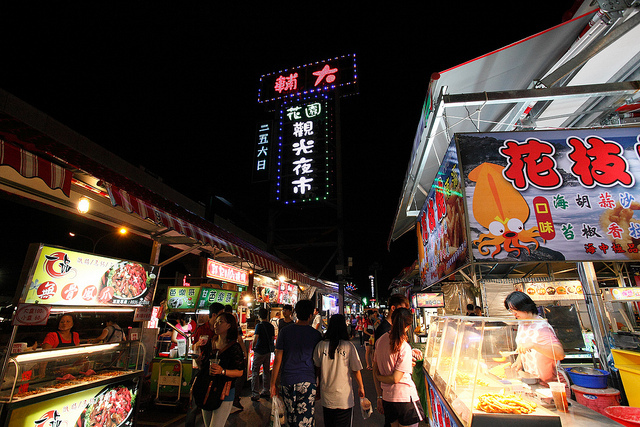 Not far from Fu Jen University is the famous Fuda Garden Night Market, where you can not only devour traditional treats but also some tastes of creativity. These include the Taiwanese Waffle, which sports the exterior of a Belgium Waffle but the taste of Taiwanese Rice Cake, and the popular fried rice balls that come in various flavors. How famous can an old and small community breakfast shop be? Pretty famous and profitable, if you’re talking about The Xiong’s Shaobing in Xinzhuang. This breakfast shop has been around for more than 80 years and is still extremely popular amongst locals. 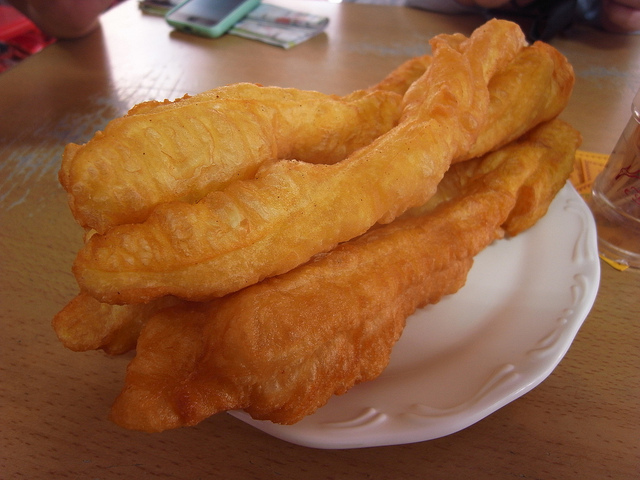 The classic set of shaobing with youtiao – crispy fried bread sticks – sells out extremely quickly, and the hot, thick and savory peanut soup is hard to find nowadays, even in the most traditional breakfast shops in Taiwan. The shop is closed on Mondays, Wednesdays and Fridays, so make sure to seize the other four days to grab this delicious breakfast early. Fried chicken can be found everywhere in Taipei, but the best Dongshan duck is only in Sanchong. 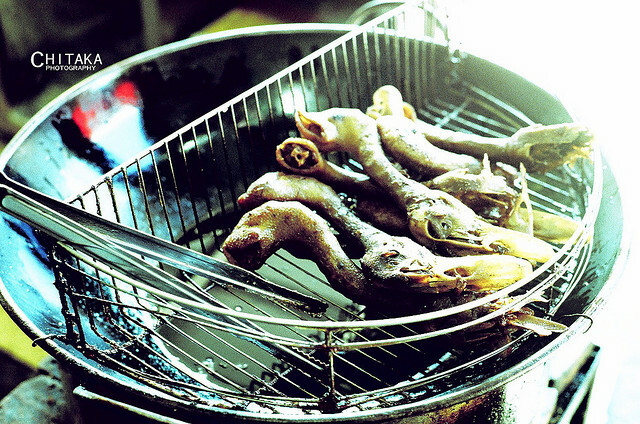 This traditional Taiwanese snack of duck is first cooked in syrup, soy sauce and other herbs before it is deep fried and served with other sides like tempura. This little stall on Lixing Road has become so popular that everything is practically sold out around 8 pm, only three hours after it opens at 5 pm. Get there as early as you can to try this awesome sweet-salty treat, and remember to grab some soda or beer to complement your perfect meal. While “last but not least sounds” like cliché, the best is sometimes, and often times, kept at the bottom of the cup. 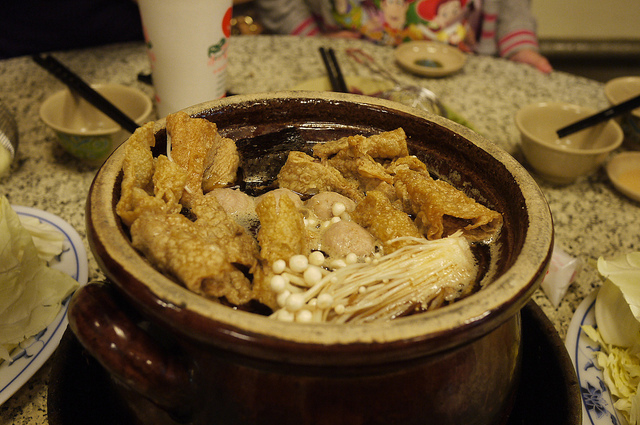 The one ultimate delicacy in Sanchong is no doubt Bawei Ginger Duck Soup. Bawei, like its Chinese name states, is truly dominant when it comes to ginger duck soup. The combination of ginger, duck, sesame oil and various Chinese herbs make it a harmony delight, served on the table while steaming and with a delicious aroma. Do it the Taiwanese way – take a couple of friends and order a big pot of the ginger duck soup, as well as some sides of vermicelli, duck meatballs and duck blood cake, and chase away the chill of winter while chatting over the best traditional Chinese medicine therapy! image via Richard, enjoy my life!